A PropMap object features a set of String-String key value pairs. So it is a Map. The class is quite similar to java.util.Properties respectively to java.util.Dictionary. Under circumstances, often given and defined below, PropMap is the better choice than any of the standard Maps. Keys and values are character sequences (hence internally Strings). Keys are not empty and do not have surrounding white space. As already contracted by Map, keys are unique. A PropMap object is by this condition a set (Set); see also entrySet() respectively keySet()). According to the "non empty non white space surrounded" condition, many methods accept CharSequences as parameter for the key, which they strip from surrounding white spaces, should those be there. See TextHelper.trimUq(..). If the key is then still not empty, it is accepted and used as such. This class PropMap is the parent of AppLangMap and de.frame4j.util.Prop in the same package. The pedigree Prop -> PropMap -> AbstractMap separates Collection's aspects clearly from many extra services for applications, Servlets and else, especially for de.frame4j.util.App's inheritors. 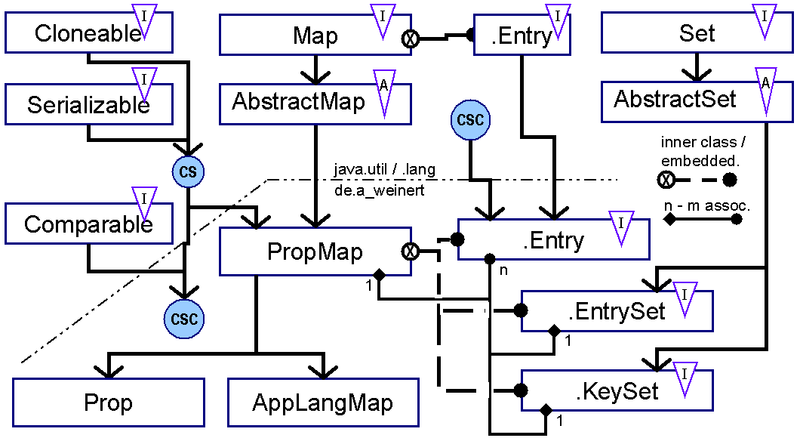 Figure 1 shows those relations between the mentioned types, namely PropMap, its inner classes PropMapHelper.Entry, PropMap.EntrySet and PropMap.KeySet, as well as Prop and AppLangMap and the Java-Collection-Framework's classes and interfaces. Figure 1: PropMap and the Collection-Framework — relations. Primary intended usage of PropMap (and of its inheritor Prop) is the settings of modes and options as well as the handling and evaluation of start parameters for applications of all kinds as well as for other single objects (Beans). allowing empty and null as value. All (nearly all) those settings of applications, Servlets and so on are given as character sequences (in text form) in the beginning, be it as command line parameters, contents of .properties, .ini or .xml files or as (parameter) attributes in a .html-tag. As second consequence of the main intended usage is a wide support for "prefixed" and "indexed" properties, by optional special handling for exemplary keys like uhu9 uhu09 uhu de.uhu de_DE.uhu en_GB.uhu. Phase 2: utilisation with now fixed endowment of keys. And usually phase 1 is done in exact one thread (initialising the application, Servlet end so on). Make and modify) the PropMap in one thread completely, and then use (read, copy, clone) it unmodified in one or more other threads. Applications sticking mostly to this frequent pattern of usage are served by this class and its inheritors quite well and with less consumption of resources than the standard alternatives. So PropMap and its extensions may be a good choice even when the extra features and services are not needed. The generation of subsets is often needed in above mentioned phase 2 and is normally quite expensive. Here is a cost optimised realisation (by subSet(CharSequence)). which will substitute the empty String for null. Hint 2: The methods equals(Object) and hashCode() of standard containers (including the parent class AbstractMap) are (have to be) quite expensive. They are optimised here finally. © Copyright 2004 - 2006, 2008, 2009 Albrecht Weinert. Maximum length of loaded .properties files or resources list. Maximum of "hash miss side steps". Summed up "hash miss side steps". Message on key to be non empty a character sequence, for exceptions. The (preferred) language of this PropMap. The (preferred) region of this PropMap. Summed up re-hashes (since new or empty). Message on value to be a character sequence, for exceptions. Cache size for valueLang() look up. Make an empty set of properties. Make an empty set of properties, choosing the starting capacity. Clear / forget all and choose starting capacity. A copy of this PropMap. Is there a certain key. Get the entry for a key. Get the value for a key. Get a property as boolean. Get a property as boolean with default. Get a "numbered / indexed" property as boolean with default. Get a property as int. Get a "numbered / indexed" property as int with default. Get a property as long. Get a "numbered / indexed" property as String. Get a value for a key with default. Get a property wit a (may be) prefixed key. Get a property as String. Get a property as non empty String. Get a property if non empty String. The whole maps hash code. The hash quality as two line String. Find the index for a key. Load key value pairs from an input stream. Load properties from (just) one text file. Load properties from a text file, class related. Enter a key value pair as Entry. Take all entries from another Map. Enter a key/value pair, guaranteed to be new. Enter a new immutable key/value pair. Remove an Entry by (internal) index. Set the (preferred) language of this PropMap. Set property or make a new one. Set the (preferred) region of this PropMap. Fetch a sorted array of all keys. Sorted multi line entries list. Storing all key value pairs to an output stream. Make a subset of this key/value pairs by key prefix. State as multi line String. Get value for a key — nationalised. lock() and unlock() must be used as guaranteed pair. This is to guard those writes / modifications that must not interfere with multi thread critical reads (to be guarded by rLock). This number is the maximum of additional search steps for an entry. If non existing entry is looked for exactly hashMissMax + 1 search steps are necessary for this discovery. In a empty or weakly populated PropMap this value will normally be 0. Experiments show (see hashQuality(StringBuilder)) that values > 5 are quite improbable. Implementation hint: As this Map is not intended for use cases with a highly dynamic content, the value will not be decremented should this be possible after a remove(). So after a lot of removes an explicit rehash(null, 0) might be appropriate. hashMissSum / size is a measurement number for the actual quality of the internal hashing. It's the average of search steps to find an existing entry. Hint: This variable is pure measurement; its value has no influence on the working of any method. This counts the occurrence of necessary or explicit rehash()s. This is pure measurement. Implementation hint: set on construction and clone; would be final if not for clone(). Value: "de.frame4j.util.ProMap.Entry values must be CharSequences (or null)." Value: "de.frame4j.util.ProMap.Entry keys must be non empty (trimmed) Strings." This method returns true, if the other object o is of type PropMap, has the same size and for all o's entries one own can be found that is equal. Hint: This comparison uses no synchronisation. If one of the PropMaps change in the proceeding this method's result might reflect the new or the previous state. A shallow copy of this PropMap is made and returned. Original and copy share the PropMapHelper.Entrys existing or contained at the time of the call. Changing the value of a (mutable) entry effects both; adding and removing effects only one. The first call to deepIt() clones all shared mutable PropMapHelper.Entrys, hence making the copy independent. The operation is (internally) synchronised and (compared to Hashtable) low-cost. This method, when called the first time for a cloned PropMap replaces every mutable PropMapHelper.Entry by its copy (using entry.clone()). This makes the shallow clone() deep. If called a second time, this method does nothing. Makes this an empty PropMap (with a starting capacity of 71 entries). Makes this an empty PropMap with a specified minimal (stating) capacity. Implementation hint: inheriting classes wanting to prohibit such total clearing have to override only this method, where all direct or indirect total clearances go through. Implementation hint: This implementation removes the indexed entry from this PropMap. All other removal methods use this method. It's the one to be modified / overridden if inheritors want to avert the removal of certain entries. true if an existing entry was removed. Internal helper with little use outside this class or its inheritors. Hint: This method uses no synchronisation at all. If used outside (other method's) sync. blocks it may lie in case of concurrent modifications. -1, if no such key. Keys have to be non empty character sequences, even after "trimming". If an entry fitting the key (that has to be a legal character sequence) exist its value is returned; otherwise null. Hint: null may also be the value of an entry found. If this ambiguity is not acceptable, use containsKey(Object). This method is just like get(Object), but with a method signature better fitting this class' contract. This methods delegates to value(CharSequence). Its only purpose is the compatibility to the late Properties (facilitating the change of pedigree in some cases). This method returns a non empty String only if this PropMap contains a property / entry with key name, the value of it being a non empty String even after stripping surrounding white spaces (from the value). This (may be stripped) value is returned, or null otherwise. The call is equivalent to getString(name, null). If this PropMap does not contain a property fitting key (the parameter will be stripped from surrounding white space before) the substitute defV will be returned. If the property exists, its value will (also) be stripped from surrounding white space. If (still) not null nor empty it is returned. Otherwise the substitute defV will be returned. In other words: Instead of the value got by key from this PropMap TextHelper.trimUq(value, defV) is returned. key must be a non empty character sequence, even after stripping surrounding white space. Implementation hint: get(Object), value(CharSequence) and all other entry / value getters *) delegate to this method. Hence it's the only one to be overridden in inheriting classes, if the determination of the value is less straightforward (e.g. by having to consult substitute Maps or the like). Hint *): containsValue(Object), containsKey(Object) and PropMap.EntrySet.contains(Object) are exceptions; the work alone. Values are character sequences; null is allowed. Returns true, if and only if a property / entry by key name exists in this PropMap, having a value of "true", "wahr", "ja", "yes", "an" or "on". To be exact: The value has to be interpreted by the (rules of the) method TextHelper.asBoolean(CharSequence) as true. If there's no property named name here defV is returned. Otherwise it is tried to interpret the value by asBoolean(value, defV) as a logical value. If that is feasible by that method's rules that value is returned and defV otherwise. Otherwise it is tried to interpret the value by asInt(value, defV) as a whole number. If that is feasible by that method's rules that value is returned and defV otherwise. Otherwise it is tried to interpret the value as a (long) whole number. If that is feasible the that long value is returned and defV otherwise. If there's no property / entry named key here null will be returned. Otherwise the entry will be removed and its value returned. In the case of the enty's removal is denied (could be done by an overridden method remove(int) only) null is returned also. The key supplied has to be a non empty character sequence even after being stripped from surrounding white space by TextHelperTextHelper.trimUq(CharSequence, String). Otherwise an IllegalArgumentException is thrown. If there's already an PropMapHelper.Entry for key, its value will be changed, otherwise a new pair (key, value) will be made and entered to this Map. This method is like put(CharSequence, String) but without checks; it's a internal helper for correct parameters. Like put(CharSequence, String) but without any checks and for a really new entry only. Like put(CharSequence, String) but without any checks; internal helper. This method just delegates to put(CharSequence, String), better called directly if value's type is String. Keys must be non empty character sequences even after stripping surrounding white space. If there's no entry for key defaultValue is returned. Otherwise the entry's value is returned even if it is null. (Thas is the difference to getString(CharSequence, String). If there's a property key + num (in any of the forms mentioned below) its value is returned even if empty. If num in the range 0 to 9 and if key + num above fails the same is tried with one leading zero ("name7" e.g. and also "name07"). If that fails index brackets () around the number are tried also (would be "name" in above example). If that fails and if num == 0 the "pure" property key is searched for. If all fails defV is returned. If key is null or empty null is returned. If pref1 is not null and there is a property named pref1.key its value is returned (also if it is empty). Otherwise the same is repeated withpref2. If that failed the "pure" non prefixed property key is searched for. If none is found defV is returned. This method gets a property value by getProperty(name, num, null). If that returns null, defV is returned. Otherwise the returned value is interpreted by asBoolean(value, defV) as logical value that will be returned. Otherwise the returned value is interpreted by asInt(value, defV) as numerical value that will be returned. For a null or empty key (after removal of surrounding white space) the substitute value defV is returned. The steps 3..6 are done by substLang(key, lang, regio, defV), so this behaviour or strategy could be changed in classes extending PropMap. If all endeavour fails defV is returned. The returned value is cached for the (non empty key); so subsequent requests for the same (VL_CL) keys are returned very fast. This method is used in the (final) method valueLang(CharSequence, String) and may be overridden in extending classes to implement further endeavours or other strategies to get nationalised property values. If a language was set, it will be returned. Otherwise the default (or runtime) language will be set before. If the parameter language is null the (preferred) language will remain unchanged, if it was already set. Otherwise the values will be chosen from a property "language", if present, or by the (default) rules of TextHelper.checkLanguage(CharSequence, CharSequence). The parameter will be checked / corrected according to the rules of TextHelper.checkLanguage() with an already set language as default. The (preferred) language of this PropMap will the be set accordingly. Should this PropMap contain a property key="language", its value will a) be used as default for parameter null and b) be set accordingly. Five letter parameters on the form "en_GB" are accepted, too. in this case the last two characters are passed to setRegion(CharSequence) and the first two taken as effective argument to this method. If a region was set, it will be returned. If the parameter region is null the (preferred) region will remain unchanged, if it was already set. Otherwise the values will be chosen from a property "region", if present, or by the (default) rules of TextHelper.checkRegion(CharSequence, CharSequence). The parameter will be checked / corrected according to the rules of TextHelper.checkRegion() with an already set region as default. The (preferred) region of this PropMap will the be set accordingly. Should this PropMap contain a property key="region", its value will a) be used as a default for parameter null and b) be set accordingly. This method enlarges the capacity and enters newEnt at the "hash right" spot. newEnt - null or until now not yet entered. Violating this rule produces any chaos. If an entry with the same key as newEntry is not yet in this map newEntry will be put in and null will be returned. Null will also be returned if newEntry is null. If an entry with the same key exists already it is replaced only if it is either not immutable or the values are the same. Trying to change / replace an immutable entry will be punished by an UnsupportedOperationException. Implementation hint: All other entry methods of this class rely on / delegate to this one if changes to the set are due. Extending classes must only override this method (and keep the implementation by super(..)) if extra work on changes has to be done. The parameter key is stripped from surrounding white space. If (then) empty nothing happens and and false is returned. If an entry fitting key is already in this Map it is not touched and false is returned. Otherwise a new entry key/value is made and entered. true is returned in that case. Non regarding the return and parameter types this method is exactly like putIfAbsent(CharSequence, String). This method makes a new entry, i.e. a key value pair according to the parameters (after trimming key from surrounding white space) if no entry fitting the key is yet there. If key is empty or there is already an entry fitting key nothing happens and null or the existing value is returned. Otherwise a new mutable entry (trimmed) key / value is added to this PropMap and null is returned. This method replaces the value of an entry for key only if that entry is already in this map and it is not immutable. This method replaces the value of an entry for key only if that entry is already in this map and it is not immutable and if its former value id oldValue. The call is equivalent to setProperty(keyValue, false). The call is equivalent to setProperty(keyValue, true). where : or = may be surrounded by spaces. This separation gives a key / value pair. " uhu = otto 3 ", for example, means key "uhu" and value "otto 3". A missing or empty key will have no effect at all and return false. A missing value will be (String)null (not the empty String). If onlyNew is true and an entry fitting key already exists nothing happens and false is returned. Otherwise an entry fitting key will be made or modified. True is returned if the entry is new or had the value null until now. This method makes a new entry, i.e. a key value pair according to the parameters (after trimming key from surrounding white space). If key is empty or there is already an entry fitting key nothing happens and false is returned. Otherwise a new mutable entry (trimmed) key / value is added to this PropMap and true is returned. The obvious effect of this method is that described for AbstractMap with extra exploiting the cases where map is of type PropMap or where map's EntrySet contains PropMapHelper.Entrys. If map map is not a PropMap only those entries will be transfered that fulfil this classes contract for values and keys. key/value pairs of type CharSequence/Number, CharSequence/Character or CharSequence/Boolean will be transformed accordingly. Appended to the supplied StringBuilder are two comment lines (beginning with # ) describing the actual hash quality of this PropMap object. For testing and debugging purposes. Appended to the supplied StringBuilder will be a multi-line list sorted by keys (with at least one line per entry) of all entries (PropMapHelper.Entry). A multi-line list sorted by keys (with at least one line per entry) of all entries (PropMapHelper.Entry) will be returned. The returned list will be prepended by two comment lines describing the actual hash quality of this PropMap and by two empty lines. The outputs syntax is a property list readable / parsable by this classes respectively Java API's rules. Into this PropMap object all properties (key/value pairs) parsable from the text file FileName will be entered or modified accordingly. See PropMapHelper.load(InputStream, CharSequence, Map) for syntax and all details. If the file opening, reading or closing fails (by any exceptions) false is returned. Nevertheless some entries may have been changed or added to this Map. Exceptions thrown by PropMap operations will be forwarded. That will end the process. In case of success true is returned and fileName will be recorded as one of the files / resources loaded. fileName - the name of the text file to be parsed and loaded. If null false will be returned. The file will be related, if feasible, to the class loader determined by the parameter cl. Used accordingly, this can have the effect of getting the denoted text file as resource from the application's or Frame4's (the framework's) .jar file. This is the best way of deploying properties, (beans) settings and else as resources. If the .jar file is signed, the protection against manipulation applies to the properties as well as to the classes / code. Calls store(this, output, startComment, encoding). If prefix is null or empty this PropMap object itself is returned (this). Otherwise a new PropMap object will be made and filled only with those entries, which's keys are longer than prefix and start with it. Each new entry's key will be shortened by the given prefix. If this PropMap is of the type Prop, a Prop object will be returned. Example: If this Map contains a property with the key "serialA-baudRate" and the value "38600", subSet("serialA-") will contain a property "baudRate" with the (same) value "38600". Some methods (of legacy classes) do insist on getting a Properties or a Dictionary object, while really wanting any Map. This happens mainly in older APIs, like in javax.mail but also in OSGI implementations. For those cases only, this method delivers the whole content of this PropMap as a new Properties object. Returned is a new @link java.util.Properties} object containing all key/value pairs of this object except for those, whose value is null. A PropMap allows for null values while a Properties container does not. This method always returns the same (singleton) PropMap.KeySet object. This method always returns the same (singleton) PropMap.EntrySet object for this PropMap. The method Set.toArray() returns (every time) a new filled PropMapHelper.Entry array.